CRIME, GUNS, AND VIDEOTAPE: Chicago’s Father Pfleger, a Priest or a Political Firebrand? Chicago’s Father Pfleger, a Priest or a Political Firebrand? Chicago, IL—The Reverend Michael Pfleger stood at the helm of the African-American attended St. Sabina Church. He’s currently suspended and can’t preach there after he was insubordinate and disobedient to Cardinal Francis George. Pfleger is a political gadfly preaching his ideology. Rather than to save the souls of his parishioners he has an agenda of ministering their political beliefs. He’s 99 percent political and only one percent religious. Pfleger never met a TV camera he didn’t love and when he talks it’s about political and social issues of the lunatic Left. Pfleger, a gun control zealot targeted DSA Arms in Barrington. They make high end rifles and carbines for a law enforcement and military market. They simply don’t sell their products to the general public. Pfleger brought a busload of parishioners there to picket and parade in front of media cameras. The rub here is DSA Arms does not make an affordable product that would interest Chicago’s street gangs. I guess it’s all about symbolism and not substance. 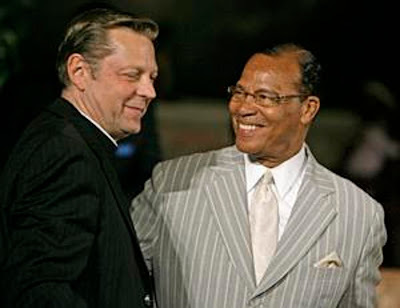 Pfleger had reportedly threatened to leave the church altogether if he could not play into Chicago’s politics. That’s hardly in keeping with a catholic priest’s vows. Pfleger has even tried to enlist parishioners in his fight with the church leadership. Ugly does not begin to describe Pfleger’s conduct here. He's a disgrace and should have his collar removed! What a bum and I'm a Catholic! But hey, they come in all faiths you know.. Soon to be the new CPD Chaplain. You sir are correct. Paul, I know you have been away for awhile, but FYI, we have the best Chaplain's in law enforcement right here in Chicago. The Command Staff however wants to get rid of them and replace them with one single guy and guess who that guy is. That's right, the one and only Father Fraud. I have the letter from Father Nangle describing how he was informed. I will email it to you. If father fraud is appointed, the CPD will have a major uprising on its hands!! Pfleger is a very sick man. He is a true self-hater. I've seen people like him before, but none as far gone as he is. He is proof that the Catholic Church has lost it's way. I quit the church when they went commie in the late 60's. Liberation Theology was too much for me to tolerate.